It’s Always a Fun Day at Sunset Bay! Sunset Bay Marina is a premier Chicago marina. We are conveniently located along the Calumet River at 13620 S. Hoxie Avenue, just south of the Thomas O’Brien Locks. Boaters have easy access to beautiful Lake Michigan, as well as fresh water moorage with many dock options. Our facilities are one of the finest in Chicago. 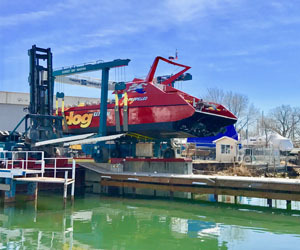 Whether you are in need of seasonal docking, maintenance service for your boat, haul-out, lift service, indoor or outdoor storage, our professional staff is always here to assist you. Spacious 48,000 square foot indoor heated storage with racking as well as acres of outdoor storage. 5 working wells with the largest 75 metric tons/165,000 lbs. lift on the Southside of Lake Michigan. 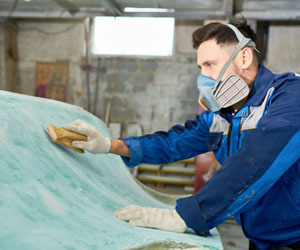 Services from custom carpentry, detailing, canvas & upholstery, fiberglass and steel fabrication. Sunset Bay Marina is 10 acres strong. 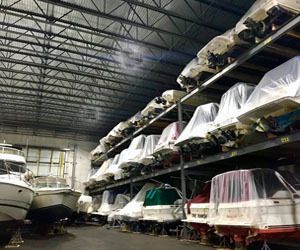 We offer several services including indoor heated and outdoor storage, almost any kind of service repairs and maintenance to your boat and engines, custom fiberglass and carpentry, steel fabrication, lift and launch, shrink wrap, detailing, bottom painting, boat relocation and 24-hour emergency towing with Tow Boat U.S. Contact 24-hour Dispatch at (800) 391-4869. Our marina has a spacious 48,000 square foot, pre-cast indoor heated storage building with racks and many outdoor storage spaces. Throughout our entire property, we have a 24-hour state-of-the-art security surveillance camera system to make sure your boat is safe and sound. Sunset Bay Marina has five working wells and individual travel lifts. We also have the largest lift on the south side of Lake Michigan with a 75 metric ton/165 metric lbs capacity! In addition, we offer Captain Service upon request. Lighthouse Bar and Grill, a fun place to eat and drink with your family is also located on Sunset Bay Marina Property! It is open daily at 11:00 am. Inside, is a large spacious indoor, full circle bar, several TV’s to watch your favorite sporting event, large outdoor patios with a stage, bocce ball and horseshoes available during the summer season. Stop by and visit us to have a drink and a bite along our scenic waterway. Visit us at www.thelighthousebarandgrill.com. If you are in the market to buy or sell a boat, we would be happy to assist in anyway we can. Please give us a call at 773.646.9900 or stop our friendly marina and see what we are all about. We are PROUD to be one of Chicago’s Premiere Marina’s! It’s Always a Fun Day at Sunset Bay!